"This recipe is a case of the whole being greater than the sum of its parts. 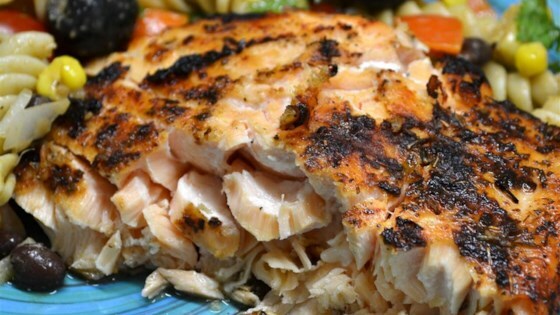 It might sound weird, but it is delicious on barbecued salmon. For decades no one in my family has served our favorite 4th of July fish without it!" Combine the butter, garlic, soy sauce, mustard, ketchup, lemon juice and Worcestershire sauce in a small saucepan. Heat very slowly over medium-low heat. Do not allow it to come to a boil, or it will separate. Serve slightly warmer than room temperature. Really wonderful! Had to use it with chicken as I did not have any salmon. It turned out just wonderful! One would look at this sauce and think it sounds horrible but let me assure you that this is one of the best sauces to pour on your barbeque salmon. Just not the same without it now. We scaled the recipe down to 4 servings for two salmon fillets and grilled them, my only change was Dijon mustard in place of the yellow.